It was heartening to see the recent publications in the West of some Indian books that had actually been written in Indian languages. But perhaps it is equally disheartening to see these publications given such little publicity. On a recent tour of London bookshops, I couldn’t find any of these titles on the shelves of even the largest: without at least a bit of publicity, the shelf-lives of books aren’t long. And the dreary orthodoxy prevailing in the Western world that the only Indian literature that is worth bothering with is that written in English remains, sadly, unchallenged. 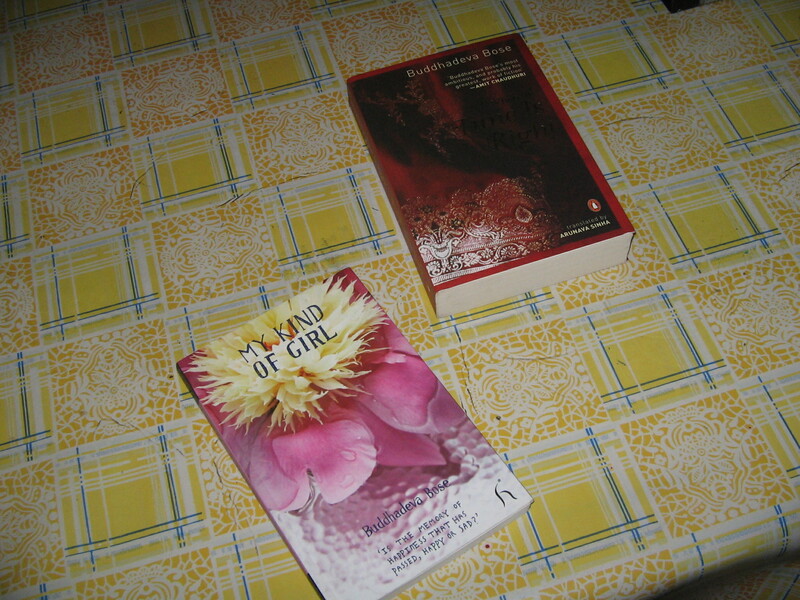 I did, however, pick these translations up while they were still available, and, last week, I read the short novel My Kind of Girl (Moner Mato Maye) by Buddhaveva Bose. 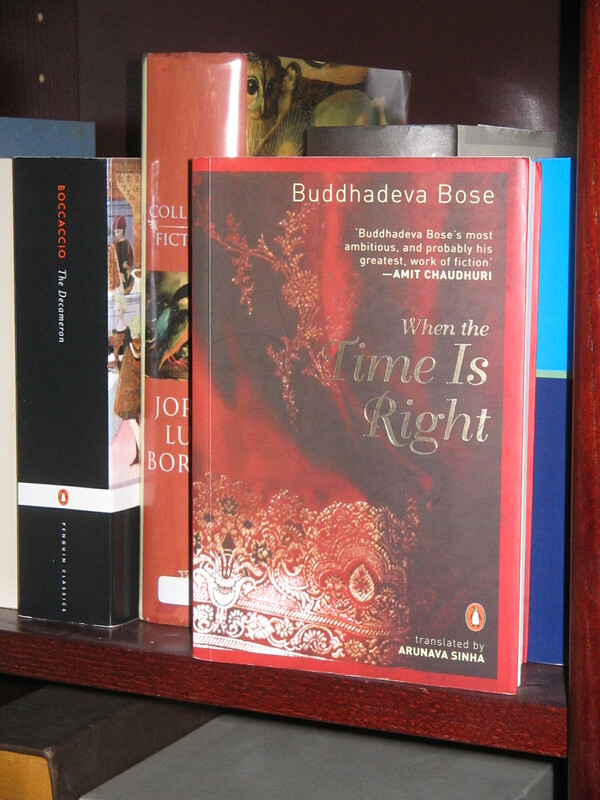 I must confess that Buddhadeva Bose is merely a name to me: having grown up in the West, largely cut off from Bengali culture, I have read very little Bengali literature outside Tagore. He is renowned as among the finest Bengali authors of the post-Tagore generations. Tithidore (When the Time is Right), reputed to be his finest novel, is available in English in India, but, as ever in such cases, not in the West. (I picked up the English translation when I was in India earlier this year, although I haven’t got round to reading it yet.) My Kind of Girl, written in 1951, is a much shorter work, and, I suspect, a much slighter work: it is deftly executed, and there was much in it that was fine; however, given the author’s reputation in his native Bengal, I get the impression that it is more a simple five finger exercise rather than a full-blown sonata. Perhaps I will get a better impression of Bose once I have read Tithidore. In Bengali, most of these words would be considered superfluous. “Next house three trees” is perfectly adequate, and, in Bengali, perfectly correct. But to write this as a proper sentence in English obviously requires a bit of “padding” – the addition of words that are superfluous in one language, but necessary in another. Most of the time, the translator does the job of padding well: but occasionally, I couldn’t help feeling that the addition of a few more words might have helped. And then, there are the idioms – the same phrase, the same words, but which carry a different charge in a different language. We come across this in the title itself: Moner Mato Maye literally means “a girl like my mind”; or, less literally and more clumsily, “the kind of girl who suits my taste”. Sinha’s title, My Kind of Girl, seems admirable; however, it implies an environment in which one may choose one’s partner: but the society depicted is one in which marriages are arranged, and in which people, both male and female, do not grow up with expectations of choosing partners for themselves. No-one here actually expects to be married to people with whom they may happen to fall in love; and when those whom they love are married off to someone else, there seems little sense of disappointment. One cannot after all be disappointed when one had no expectation to begin with. This is a very different environment from any that most Western readers will be familiar with, even though arranged marriages had been a norm in the West until quite recently amongst certain classes. That one may feel little pain when the object of one’s love may marry someone else may seem extraordinary to a modern Western reader: and yet, such is the unobtrusive artistry of Bose’s narrative style, it seems perfectly natural in the context. The four brief stories which comprise this novel all have at the centre this theme: the dislocation between one’s emotions and one’s awareness of the demands of reality. The structure of the novel is a simple one, and has often been used: four men, strangers to each other, find themselves thrown together for a while, and each tells his own story. This simple structure is familiar to anyone who has seen the Amicus portmanteau horror films such as From Beyond the Grave or Tales From the Crypt: but here, the stories aren’t horror stories: they are about love. The model is not the Amicus horror films (which this book predates anyway), but, rather, Chekhov’s trilogy of stories, “Gooseberriess”, “Man in a Case” and “About Love”. The first story is particularly painful. So painful, indeed, that the narrator has to pretend it had all happened to someone else. No-one is fooled by this, though they are all too polite to challenge him on this point. This is a story about love rejected. The narrator is a big man, physically clumsy and unattractive; he is, however, successful in life: he has a good head for business, and has become wealthy: in a society without any form of economic safety net, the security offered by his wealth makes him, despite his physical clumsiness, a prized match. And yet, when he asks his mother to arrange a marriage with a woman with whom he has fallen in love, he is rejected: she comes from a cultured family, and he and his family are seen as unrefined and boorish. Even when he saves them from being thrown out penniless on the streets, she tells him clearly that she is not for him, and that not even gratitude for his generosity could shake off the distaste she feels. Not only can he not win her love, he cannot even buy it – not even if he wants to. The rejection is final and complete. And this physically clumsy, hard-headed businessman continues to carry inside him the pain, the shame, and, also, a profound disgust with his own self. The second is a sad, wistful story: a youthful love that never had a chance of being consummated, but which lasts throughout both their lives, even into old age. The third, we are promised, is a “comic story” – a scherzo in the four-movement work. However, although no-one acknowledges it, the “comedy” leaves behind a bitter taste. The narrator falls in love with a young lady who is pining away for the sake of another. This other person, a doctor, is already unofficially engaged to an Anglo-Indian girl, who is receptionist at his surgery. And the narrator is shocked: “So an Anglo-Indian’s ploys matter more to you than a Bengali girl’s tears?” he asks. The racism, and the sheer stupidity that lies behind it, are shocking, but this narrator is too self-unaware to notice: his moral outrage even as he speaks these words is real. By the end, he ends up marrying her, unembarrassed about being but a second best choice, and seemingly not even pausing to ask what his wife feels about it all. Perhaps she married him to punish herself; perhaps, by the end, she was past caring. Who knows? The narrator certainly doesn’t: he hasn’t even given this matter any thought, and thinks of the whole thing as “comic”. This “comic” story is, however, the most disturbing of the four. The final story, the climax of the sequence, is a tragic tale. It is well enough done, but in many ways, it was the least remarkable of the four. The earlier stories had shown us a writer of remarkable talent and imagination: all I saw here was a writer who knew his craft well, but who was, at this stage, merely going through the motions. ll in all, not perhaps an unqualified triumph, but a remarkable work for all that. A five-finger exercise, as I said, rather than a major sonata. This winter, I’ll tackle Tithidore (When the Time is Right): if it lives up to anywhere near the reputation it has in the Bengali-speaking world, I should be in for a treat.